Take it all in…Yes, that is mustard yellow walls. Yes, those are pecan/orange built-ins with gold hardware. And yes, that is my half-attempt of making it all work together with a hand me down piece of art. Back in October when the basement flooded, we found this relic from the hubby’s bachelor days. During the clean out I had made an off-hand comment, “how great would it be to have a TV in the kitchen so I can watch the news or Food Network while cooking…” And guess what…MY HUSBAND REMEMBERED!!!!!!! 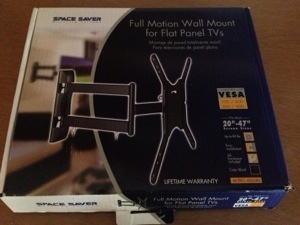 However hubs had one caveat, a TV would have to wait till our savings caught up to it, but that doesn’t mean it couldn’t be installed? 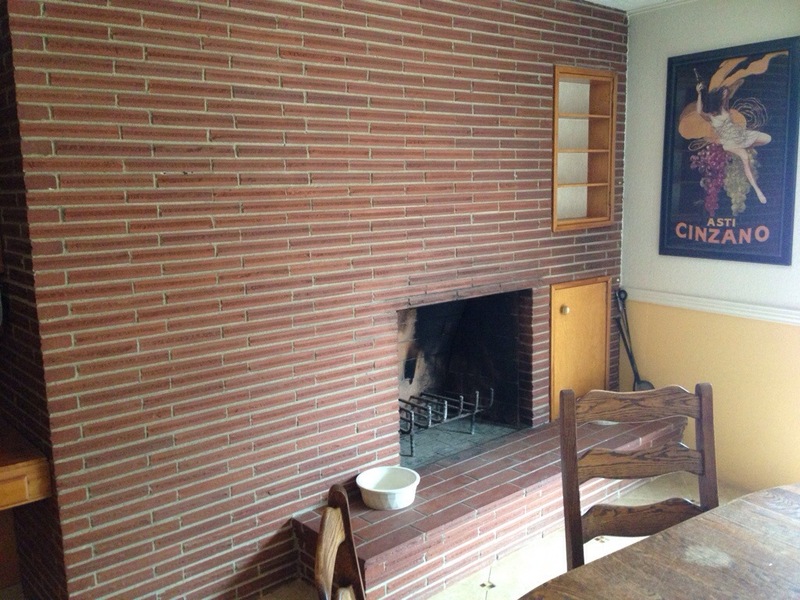 And a fireplace could be painted? I FEEL SO LOVED! 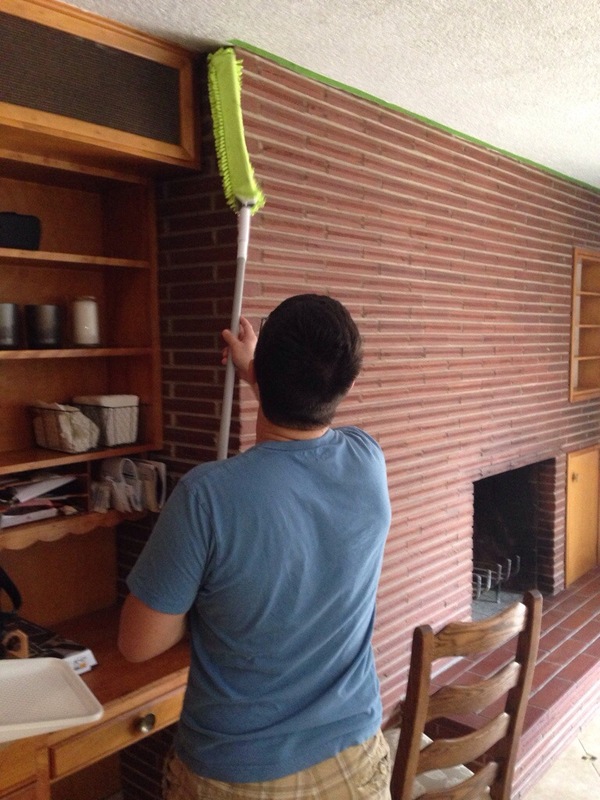 First he prepped and cleaned the fireplace. 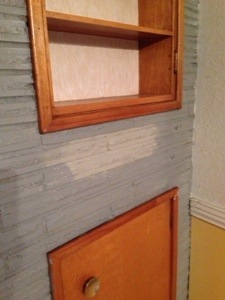 We had researched a couple of diy brick staining projects and decided to give it a go. 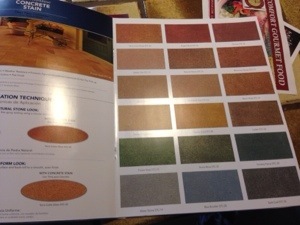 We settled on Waterstone semi transparent masonry stain by Behr. It was the lightest gray available, since charcoal would’ve been too dark for our room. 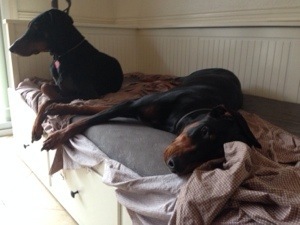 As for the dogs, they had to hang with us because of the weather…They were great supervisors. At first we were pretty satisfied, yet as the day wore on and lighting changed we noticed the gray turn bluer and bluer…You’d never guess based on the pic below that this was a robin egg blue to the naked eye. 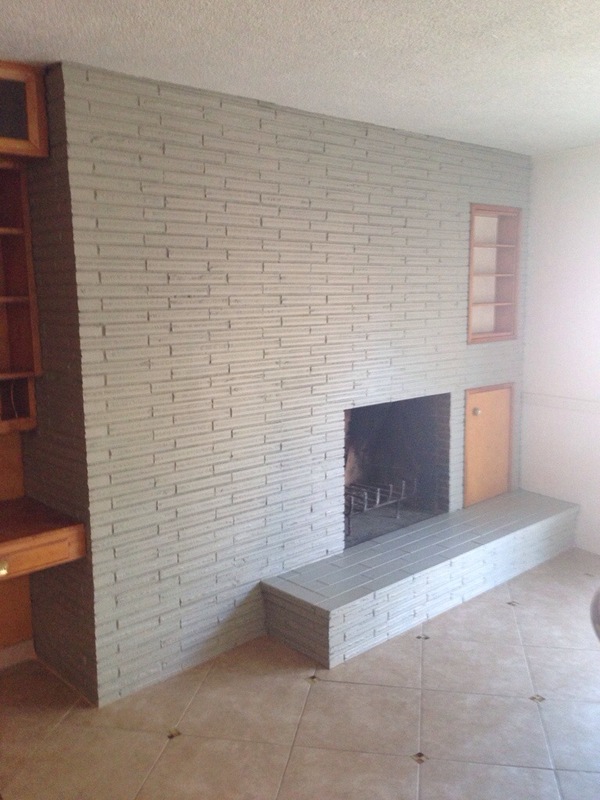 So we started to get a little desperate and try a new technique…Like paint it with leftover cement gray by Glidden (the same perfect shade of gray we used for the garage) Nope! Still blue! Finally in a moment of exasperation I just had to leave the room. 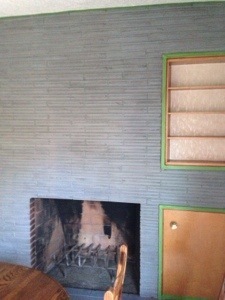 Then for the first time noticed our olive wood accent wall in the living room, in the afternoon light was gray! I mean the perfect shade of mossy light gray! 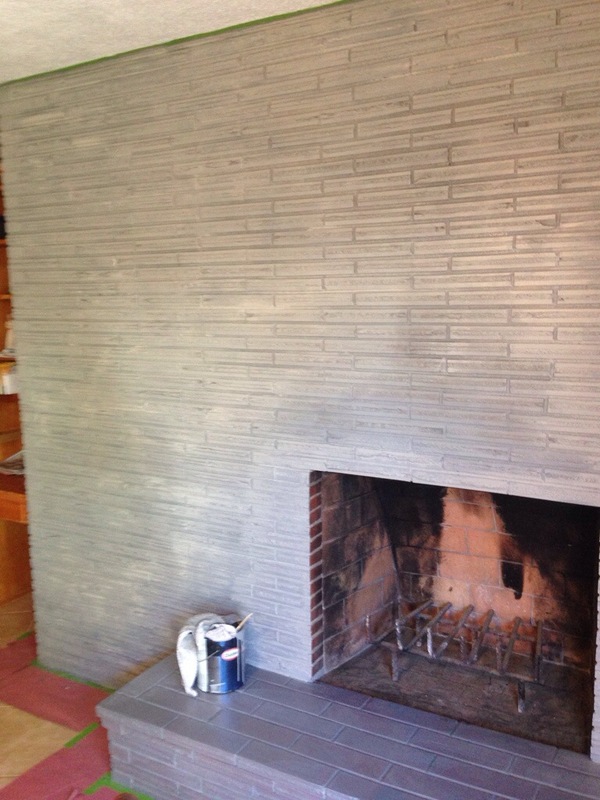 Immediately I splashed some paint on the fireplace…Voila! Gray! Yay! Color crisis adverted, a light mossy gray that seriously brightens the room..Some before and after pics shall we? Of course hubs still has some more work to do, (including setting up the TV wall unit) but we are finally tackling this room. We have several big updates in the coming weeks and so excited to share! Happy Sunday everyone! 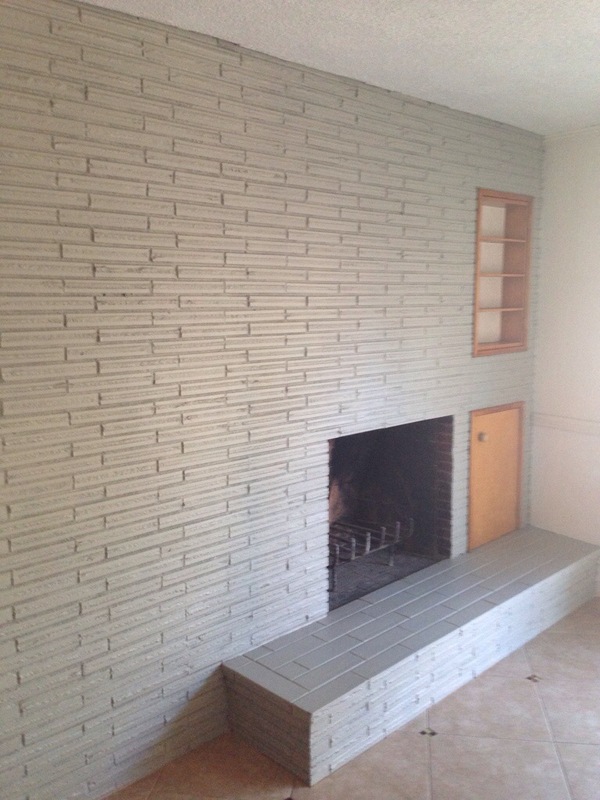 This entry was posted in Projects and tagged behr masonry stain, diy, gray painted fireplace, how to paint a fireplace, mid century fireplace, semi transparent, staining brick fiteplace, waterstone by Tandra. Bookmark the permalink.